From Venice I took the regional train to Bassano del Grappa, where I was greeted by Paolo Bellò and his wife Stefania, and two of the warmest of Venetian smiles, then on to town of Sologna where Paolo's studio occupies a prominent place on the main street. I first met Paolo at the Salon in Lecce in 2015. At that time he was shy about speaking English, mainly because he didn't speak English. Since then, he and Stefania have been taking intensive English classes in order to better communicate with their new international friends. 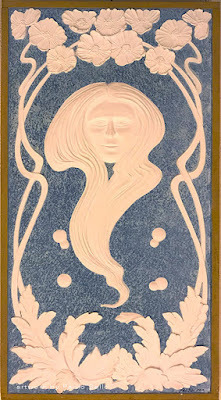 Among them, the Irish painter Noel Donnellan, with whom Paolo recently formed a collaborative company called Pigmentti. While it can be argued that studying English does not always help a person understand Noel when he gets going, both of these guys can paint, and they sure get the job done. The Sologna, Italy studio of Paolo Bellò features several workrooms, and a mezzanine displaying samples of work. The giant mistletoe design is for a house in Switzerland and was rendered in stucco bas-relief. 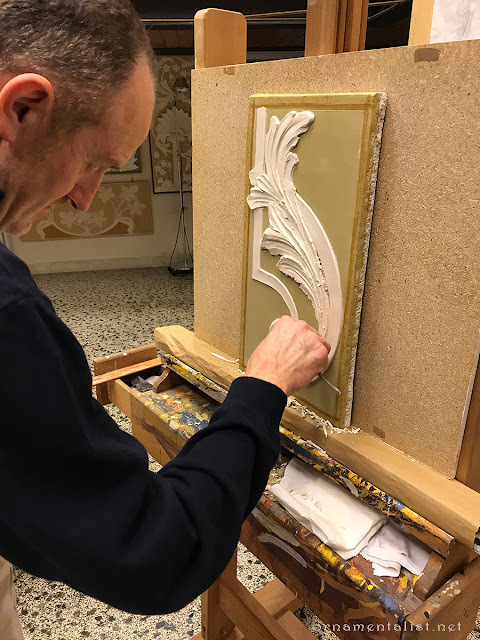 In his enormous and beautifully organized studio, Paolo treated me to a comprehensive demonstration of stucco bas-relief, one of his specialties. 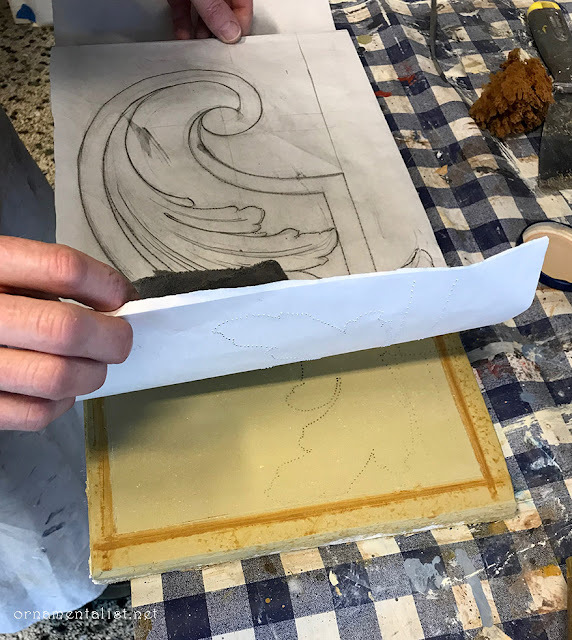 After showing me the basics of traditional marmorino, its mixing, application and finishing, as well as ways to color it, Paolo transferred a design onto the still damp plaster using a spolvero (pounce) and some charcoal. special stucco carving tools, some you buy, some you hack ! While still soft the marmorino is scratched out along the design to key the surface. New white stucco is added into the ornament areas and then sculpted using special tools. 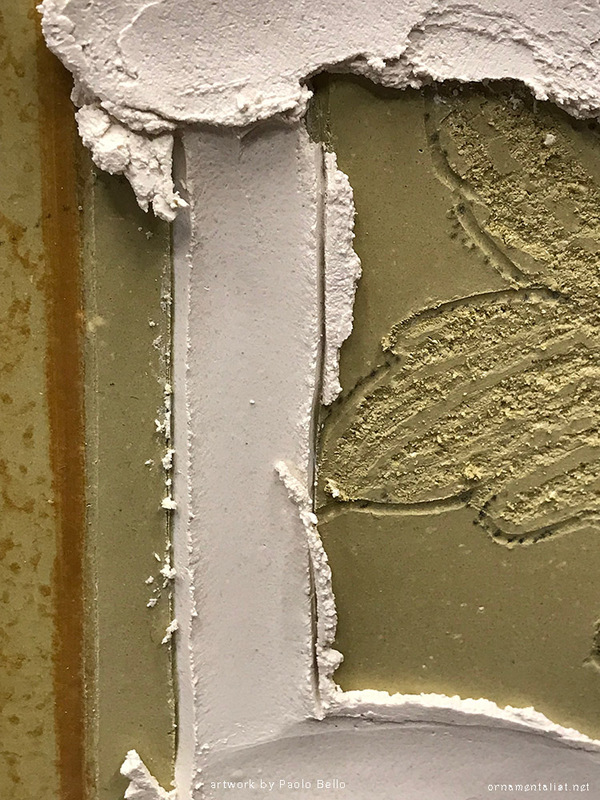 As the stucco hardens finer detail can be added, but all of this must be timed just so and this requires a real understanding of the material and what it can do. Paolo Belló has worked in decoration since the age of 14. 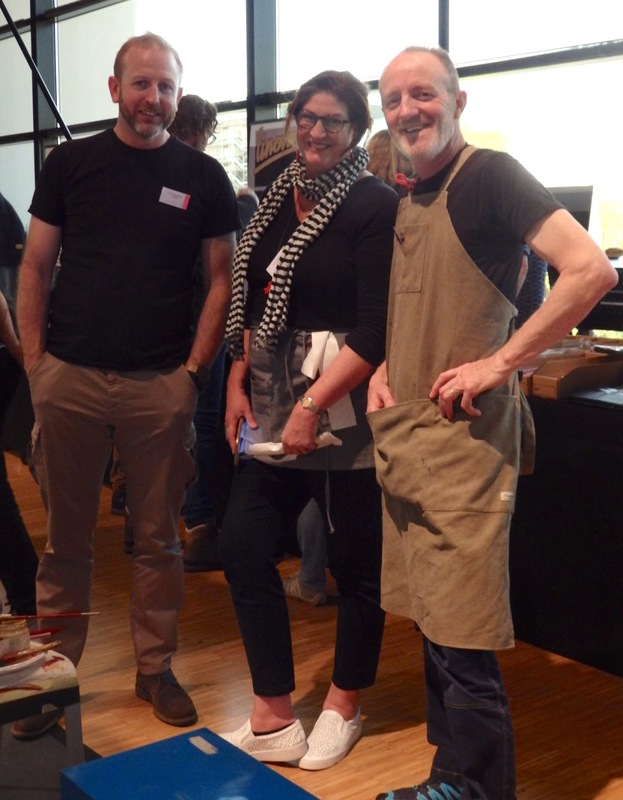 He attended the European Centre for Heritage Crafts and Professions in Venice. 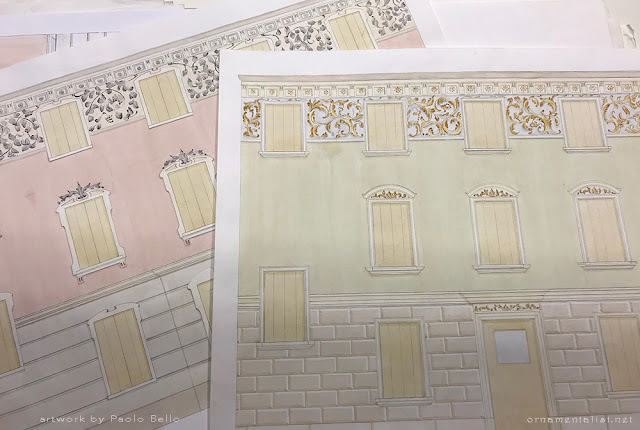 Then after studying with maestro Ennio Verenini in Bassano, Paolo was invited to join the Verenini decoration company, and three generations of knowledge was passed on to him over the next 20 years. He opened his own studio in 1994. 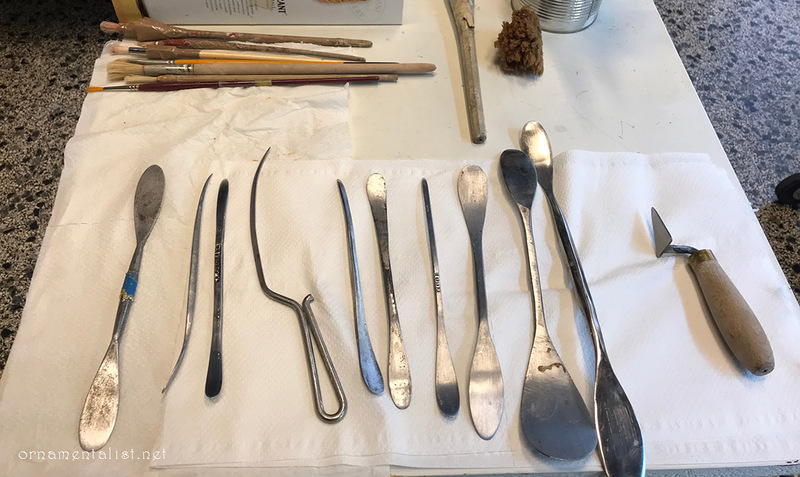 The hundreds of sketches, samples, maquettes, and tools in the studio are a testament to the the life's work of this consummate artisan. optional designs for a doorway: on the right, Paolo pays tribute to his favorite architect, Carlo Scarpa. 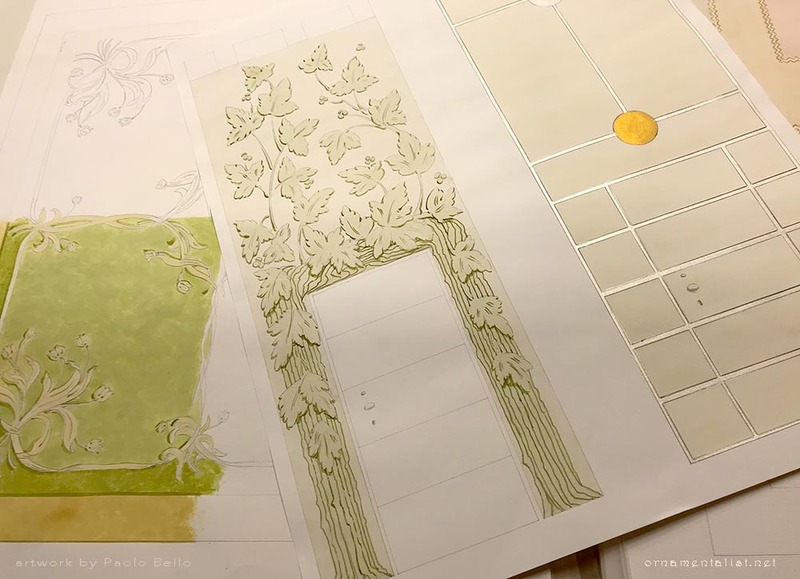 Exterior Design: sketches for two possible treatments which include ornament, color and relief stucco work. 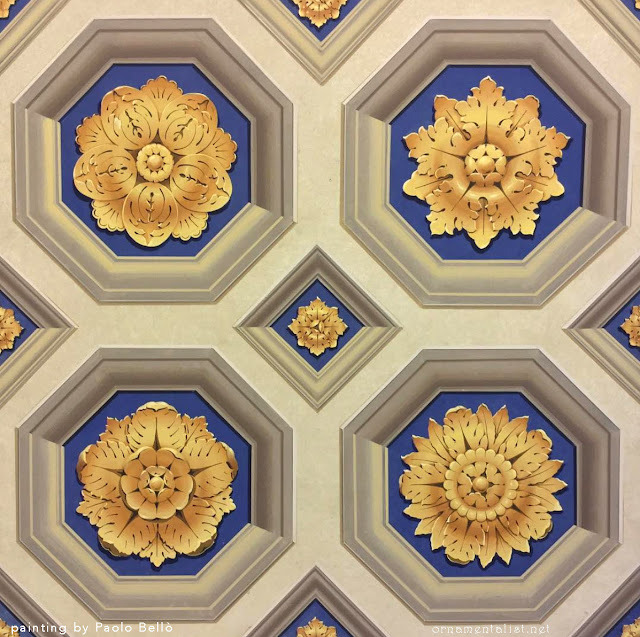 During my visit Paolo and Stefania took me on a tour of their favorite Veneto sights: the Tomba Brion of Carlo Scarpa, and the Palladian Villa Barbaro with its Veronese frescoes that make my heart sing. Along the way we passed houses Paolo has decorated with fresco sundials or ornament, keeping alive the tradition of the Veneto artisans. I look forward each year to attending the International Decorative Artists Salon, where I have met so many friends and fellow artists from around the world. This year we met in Leeuwarden, Netherlands, and I will post more about that soon! See more of Paolo Bellò's work on his website.